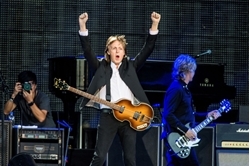 Why Paul McCartney is the most successful musician of all time | GO - Arts & entertainment. Beatles Radio: The Beatles, Solos, Covers, Birthdays, News The Fab 4 and More! By any measure, Paul McCartney is the most successful musician of all time. With his bands and his solo career, Sir Paul has sold more albums than anyone. McCartney is among the top Grammy winners, and he has dozens of platinum albums. Of course it helps that he was part of the Beatles. With 178 million albums sold, the Fab Four are the top-selling artist of all time in the U.S. The group had 43 platinum certifications, 26 multiplatinum and six diamond. But McCartney’s solo work and his material with Wings have kept him in the spotlight, selling albums and winning more awards since the Beatles’ breakup. And McCartney’s tours have ranked among the top 15 worldwide for the last six years. We took a look at McCartney and the Beatles statistics, and, in some cases, checked to see how he and they compare with other major musicians. See the stats below. Some might say McCartney deserves only ¼ of the credit for his time in the Beatles. He should get full credit.